I have started using a hair loss product called Remox III DMI, devised by Dr Oscar Klein (www.hairgrowthmd.com). Do you know anything about this? As a general principle, how can I evaluate the efficacy of this hair loss treatment? How can I ascertain whether it actually contains those ingredients? In briefing over their website, hairgrowthmd dot com appears to sell two main products for hair loss: Promox and Romox. 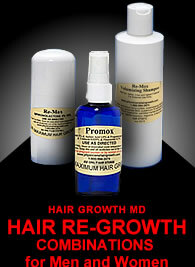 HairgrowthMD states that Promox contains the only two FDA approved hair regrowth solutions. If this is true, then Promox contains finasteride, the active ingredient in Propecia and minoxidil, the active ingredient in Rogaine. However, clinical studies and the FDA approval of finasteride is based on taking 1mg of it daily and orally. Promox is a topical solution for hair loss. Furthermore, oral finasteride typically requires a prescription. In glancing over their triple blind study as listed on their website, it appears that they have combined topical minoxidil 5% with tretinoin 0.025% (also known as Retin-A) and finasteride 0.1%. 3 groups were studies and according to their findings, those who took Promox which contains all 3 solutions had a significantly greater “success rate”. What concerns me however, is that no specifics of the study have been provided. We don’t know the size of or the degree to which each control group (let alone each individual within the group) was losing hair. Their published study also isn’t very clear as to what “success rate” means. Does success rate mean that Promox successfully slowed down hair loss, stopped it, or stimulated hair regrowth? And if so, how much? Remox for female hair loss (men can use it too) combines minoxidil 5% with tretinonin 0.025% (Retin-A) without the topical finasteride. It’s also important to understand the benefits and drawbacks of tretinonin (Retin-A). Retin-A may work to increase the absorption of the minoxidil and finasteride by penetrating the outmost skin layer (straum corneum) causing it to thin. Retin-A in itself does nothing to stop hair loss or stimulate hair regrowth. Tretinonin (Retin-A) can also be a severe scalp irritant. If you intend to try Promox or Remox, it’s probably best to start with a small dosage and work your way up to what’s recommended to be sure your scalp isn’t overly sensitive to it. Nonetheless, combining topical minoxidil with an agent (Retin-A) to assist with absorption may have some benefit. Whether a small dose of finasteride (0.1%) used topically can stop DHT from binding to the hair follicle receptor is a bit unclear. I would bet that these products actually contain the ingredients they list however; generally speaking, often times companies will oversell the benefits in order to sell their product.